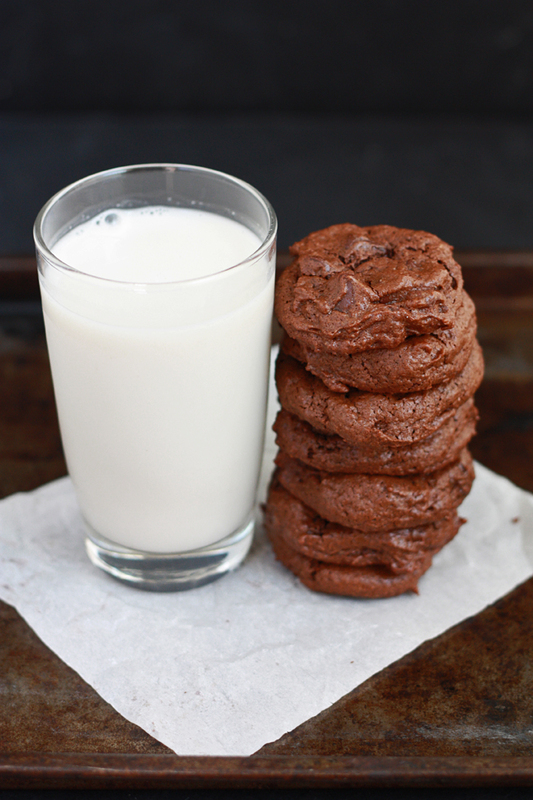 Paleo Double Chocolate Chip Cookies – These grain free, dairy free double chocolate chip cookies taste like love! You’ll want to eat them all in one sitting! There are a few very important recipes one needs in the kitchen. You’ll know what these are for you. Chicken soup for sick days, maybe your grandma’s incredible tomato sauce that simmers all day, or the pie crust you couldn’t live without. The list will be different for everyone, but I believe it should be made up of things that bring comfort and help you feel like home. Long before we went gluten and dairy free, I felt like our list was mostly complete. I had a special little collection of recipes, like old friends I knew I could call when I’d had a rough day or when someone needed some extra love. 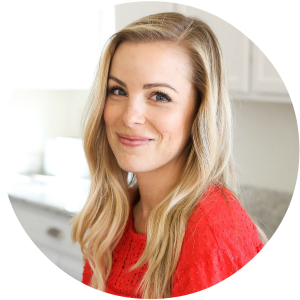 While our diet change has made such an incredible difference in all our lives and our health (especially Sophie’s), I miss a lot of our comfort food recipes. I moved a lot growing up, and it was always a rough challenge to start over. You ached for and missed what you’d grown to love, but as time passed and the sting softened, you made new friends and found new places to know and love. I like to think of gluten and dairy free cooking much like that. We’ve been riding this train for 2 1/2 years now and it seems like it’s here to stay for the foreseeable future. So, instead of spending most of my time looking back at what I miss (grilled cheese, rich fudgy brownies and the best pizza crust, for instance), I’ve really tried to make this a journey of looking forward. We’re building our new collection of recipes one piece at a time, and this is one of those new recipes. 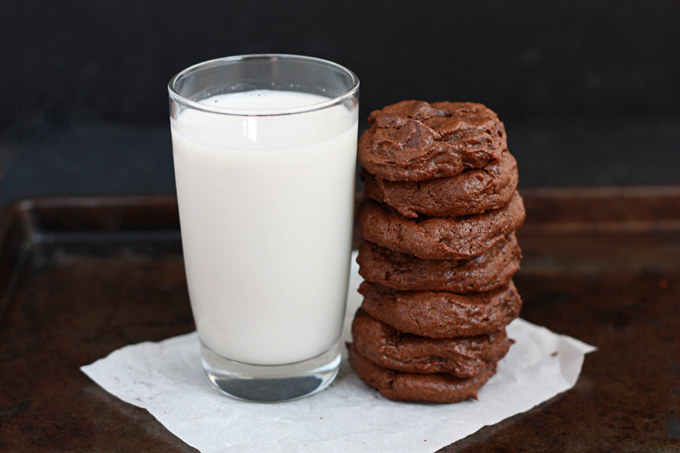 We’ve been making these double chocolate cookies for months now, slowly perfecting them. They’re deep, rich and chocolatey like a brownie. They’re crisp around the edges and tender in the middle with plenty of chocolate chips dotting the surface. These cookies feel like home. The recipe is almost instinctive now, and settling in at the table together after dinner with a warm (or, even better–frozen) cookie feels as cozy as any comfort food recipe I’ve ever loved. 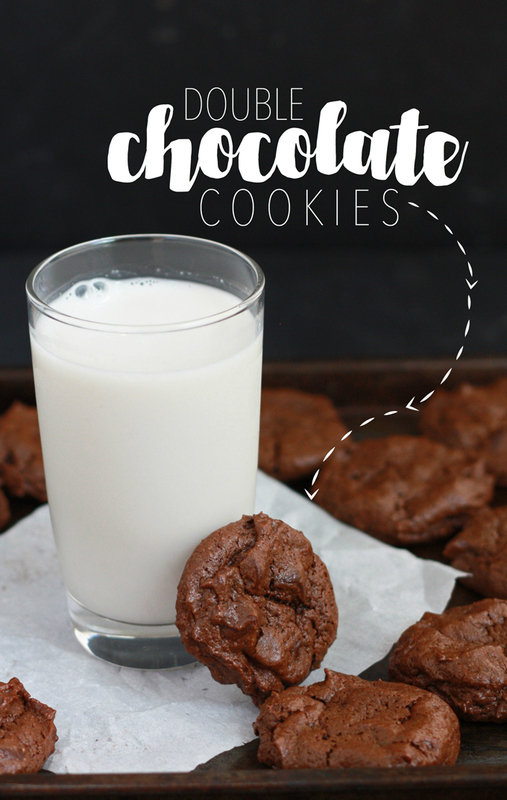 When I slip one into a lunch box or surprise Milo and Sophie with a fresh batch after quiet time, it feels like sharing a little packet of cookie love. And what is life without a little cookie love? My Favorite Way to Eat These is… when I can make them with maple sugar, which I find at Sprouts, Whole Foods, or fine foods stores. It’s the very best sweetener in all the land. Rich and deep with buttery caramel notes. It’s also exorbitantly expensive at about $11-12 per pound, so I only make them that way a few times a year. Let’s Talk Almond Flour. I also use blanched almond flour (Honeyville brand which I can buy for the best price at Costco). Honeyville brand is the finest, most consistent grind that I’ve been able to find. If you’re using another brand (like Bob’s Red Mill, etc.) you may need a little more almond flour to achieve the right spread. Bake a test batch of 2-4 cookies and see how wide they spread. If they spread too thin, add a little more almond flour and try again. These cookies taste like love. Melt the chocolate chips over very low heat until smooth and glossy. Allow to cool somewhat. Combine coconut oil, cocoa powder, and sugar until the granules have dissolved somewhat. Add eggs, vanilla, and almond extract and continue to beat until very smooth. Mix in cooled melted chocolate. Line a baking sheet with parchment paper or silicone mat. Scoop dough into 1″ balls and place 12 on the baking sheet. Baket at 350 degrees for 9-10 minutes, or until the edges are set but the centers are still a bit soft. Allow to cool 5 minutes on the baking sheet (the residual heat will set the centers), then transfer to a cooling rack. Repeat with remaining cookie dough. These cookies look amazing! I’m definitely going to have to try these asap! 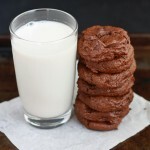 Craving a good chocolate cookie right now.. this is just how I like mine! Made these and froze them. Have hidden them twice from my husband. He keeps finding them. He says he doesn’t like chocolate but he sure likes these, me too!!! Macadamias sound INCREDIBLE! Totally trying them! What chocolate do you use to make it dairy free? Enjoy Life Chocolate Chips are great! They’re completely allergy friendly. No gluten, dairy, soy, eggs, nuts, etc. The flavor is awesome! (I find them at Sprouts, Fry’s (Kroger), Whole Foods, Target, Safeway, or Amazon! I don’t have almond extract. Is their something else I can use? Kati – Honestly, you can just skip it! They’re delicious with just the vanilla, too! My cookies came out totally flat! Not sure what happened. Are you supposed to melt the coconut oil or no? I don’t melt the coconut oil with mine. What brand of almond flour did you use? Because almond flour can vary brand to brand, if my cookies come out flat, it usually means I need a few extra Tablespoons of flour. I’m so sorry they didn’t come out as you’d expected! These are soooo good! Just made a batch and ate two immediately, heading back to the kitchen for another and to hide the rest 🙂 . These will be a regular here, thanks so much! YAY! I’m so glad Amanda! Thank you for sharing! We have no dietary restrictions, but i made these for a friend who is paleo at the moment. They were very good. Just chewy enough, but also dense enough to feel like “real” cookies. I only made half the recipe, and i did add about half a tablespoon of arrowroot flour, but still. They will have a different texture if you use a liquid sweetener. In general, you substitute 1/2 the amount of liquid sweetener for powdered, but I haven’t tested this with honey, so I’m not sure if the recipe would need other adaptations to accommodate the additional liquid. I’m sorry! If you experiment with it, I’d love to know how it goes!